Hey guys, Zenthanith here once again! Sorry for the slow releases recently, have been very busy in real life T_T. But no worries, in just a week the chaps shall be back on regular schedule and if u want more chaps a week, show me that suppooort! Leave comments down below and leave some excellent reviews and 5.0 ratings on Novelupdates. Remeber to share it online with others too! It only takes a minute and it means the woorld to me! Well hope u guys enjoy what’s going to come cos it’s going to be great reading and thank all you readers for your support! Catch u guys next time! Looking at the docile beasts in front of him, Su Yi recalled the scene which he had just seen earlier. Something seemed to have happened to the beasts in this mysterious space when they were enveloped by the light. Maybe all this had something to do with the mysterious space. Seeing the shocked Su Yi, the beasts lifted their heads and looked at him. Their eyes filled with respect and curiosity. Breathing in deeply and calming the shock in his heart, Su Yi started to snap out of his daze. Observing the beasts in front of him, there was a huge tiger, a fiery-red mink, a white bird, a black mouse the size of a baby, a jade-white butterfly three meters large and the Golden Titanic Python. There were altogether six beasts and the one with the strongest aura was still the Golden Titanic Python. Now, the aura of the Golden Titanic Python seemed to have entered the Demonic Spirit Realm. Looking at the beasts and seeing them gaze at him. Su Yi could not help but ask them the question. Beasts were considered demonic beasts, but it was only after a beast had entered the Demonic Void Realm that they were considered a true member of the demon clan. Only then were they considered as true demonic beasts. Rumors had it that beasts which had entered the Demonic Void Realm were even able to speak the human tongue. And the beasts which had entered the Demonic Emperor Realm, let’s not talk only about Demonic Beasts, but once any demon entered the Demonic Emperor Realm, it would be able to turn into a human form. But now, Su Yi just wanted to know whether these six beasts understood his words. Following Su Yi’s words, the six beasts let out a roar. They did not nod but rather it seemed like they replied. Su Yi was stunned for a moment, but then he did not think too much of it. Demonic Xuan Realm beasts were stronger than the cultivators of the same cultivation level. Naturally, their intelligence would not be too far apart either. Though Su Yi was surprised that these beasts could understand his words, he did not find it all too strange. “Why did you guys come in?” Su Yi asked the beasts. Hearing his words, the six beasts looked at each other and did not know whether to nod or to shake their heads. “Oops, I forgot that you guys aren’t able to speak the human tongue,” Su Yi was slightly stunned but then he smiled bitterly. These beasts could understand him, but they had no way to speak to him. The Golden Titanic Python’s tongue flickered in and out of its mouth. Its eyes closely followed Su Yi. It moved its tail and brought the two golden eggs not far away in front of Su Yi, its eyes pleading for something. “These eggs are yours?” Seeing that the Golden Titanic Python did not have its initial hostility towards him, Su Yi was not as cautious as before, but he still did not let his guard down. The Golden Titanic Python nodded its head, showing that he fully understood what Su Yi was saying. “What do you want me to do?” Su Yi gazed at the two faintly golden eggs which were on the floor. He was confused, he did not know the intentions of this snake. The Golden Titanic Python continued to flicker its tongue, and its tail repeatedly moved the golden eggs towards Su Yi’s feet. “Are you trying to let me eat them?” Su Yi was dazed for a moment. Could it be that this snake wanted to have me eat these two eggs? The nutrition level of snake eggs seemed to be extremely high and furthermore, these were the eggs of a Golden Titanic Python, the nutritional level must be through the roof. Hearing Su Yi’s words, the Golden Titanic Python immediately changed its attitude and curled up its tail, protecting the two eggs within the coil. Its eyes looked at Su Yi with caution, like it was on guard against a bandit. And the other beasts were also surprised and looked at each other. “I’m just joking. Do you want me to take a look at these two eggs?” Su Yi gently smiled and asked the snake. The eyes of the snake were filled with delight and it repeatedly nodded its head. Su Yi crouched down and begin examining the two eggs, but he still had his guard up against this horde of beasts. Carefully examining the two golden eggs, their glossy surface seemed to be smooth and glowing, but they had multiple small cracks as if they had been dropped on the ground before, however much of it had already closed up. The original cracks should not be so shallow. Su Yi discovered that within these two golden eggs, there were signs of movement. There were lives inside of them. Su Yi was also surprised. Within these two eggs, there was also a strange power moving around. The aura given off was extremely powerful. What made Su Yi more surprised was that the strong aura emanated from these two eggs seemed to have some kind of connection with him. The connection was very strong, but this strong connection seemed to have calmed down afterward. 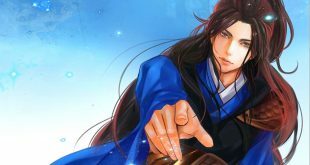 “Do you want me to do something?” Su Yi carefully placed the two eggs in his hands onto the floor. He looked at the Golden Titanic Python and asked. He was also very curious about these two eggs. The Golden Titanic Python kept on nodding, his eyes pleading for something. Su Yi’s eyebrows furrowed as he examined the two eggs. He could not understand what the Golden Titanic Python wanted him to do. Suddenly, the Golden Titanic Python slithered up to where Su Yi was once seated and kept on pointing towards the jade bottle which contained the Yuan Spirit Elixirs with its tongue. Then, it turned around and looked at the two eggs. The Golden Titanic Python nodded its head, its eye gleaming with joy. Su Yi was shocked. It was not that he could not bear using these two Yuan Spirit Elixirs. If he could become friendly with this initially hostile Golden Titanic Python with just the two Yuan Spirit Elixirs, then that was definitely a good thing. But the problem was that these two eggs were not beasts or creatures. How could they consume the elixirs? Furthermore, when Su Yi just checked the two eggs, other than those minor cracks, there seemed to be no other injuries. He could even feel a powerful aura swirling within. The Golden Titanic Python slithered beside the two eggs and coiled its body around them. Its eyes were full of pain and sadness as it gave out a cry of lamentation. Su Yi looked at the Golden Titanic Python. There was no doubt that these two eggs were the offspring of the snake. It may be that the golden eggs were seriously damaged and the Golden Titanic Python wanted to use the elixirs to save its children. Such a scene touched Su Yi’s heart as he promised the snake. Hearing Su Yi’s words, the eyes of the Golden Titanic Python beamed and instantly it shifted the two eggs in front of Su Yi and looked at him gratefully.